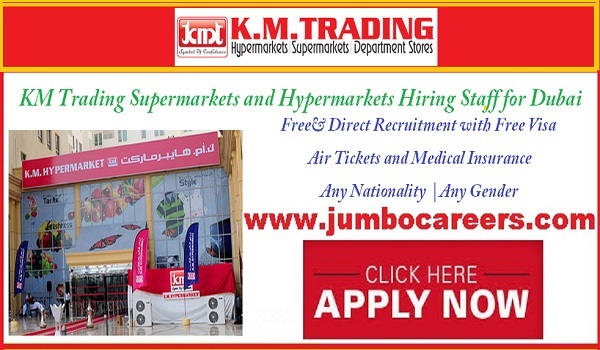 Leading Hypermarket & Supermarket chain in UAE K.M.Trading hiring experienced staff for Dubai. About the Company : K.M. Trading aspire to empower all customers who walk through our doors with a distinct advantage in leading their chosen lifestyle with pride and satisfaction, irrespective of their social and economical status. This apart, we seek to become a dependable and reassuring companion who deeply perceives, and cumulatively fulfills their lives’ needs, desires and dreams. Candidates interested to apply for KM trading Dubai Jobs 2019 may send their latest resume with subject as job title to: hr@kmt-group.com.